BitStarz Casino is an bitcoin online casino including mobile and live dealer games, established in 2014 using games powered by multiple software providers. It is operated by Direx N.V. and is licensed under the jurisdiction of Curacao. BitStarz Casino was established in 2014 and is the project of Direx N.V. Casinos. It is known for accepting payments in cryptocurrencies along with Credit/Debit Card deposit. The site uses SoftSwiss Platform to power its games on various devices. This platform ensures quality and optimization in gaming for customers. Many software giants provide their games on this site. These include NetEnt, Microgaming, Ezugi, Betsoft, Play’n Go, Habanero, and Evolution Gaming along with many others. All these providers are known for their gaming standard and variety of games. The site uses a license from the government of Curacao. Bitstarz Casino does not accept players from American Samoa, Arizona, Arkansas, Asia, Guam, Italy, Netherlands, New South Wales, Spain, United Kingdom, United States. Players from Bosnia and Herzegovina, Croatia, Greece, Austria, Hungary, Macedonia, Mauritius, Montenegro, Slovenia, Finland, Albania, Kosovo, and Serbia are welcome at the casino, however, they cannot claim any promotions whatsoever. Furthermore, the United Kingdom, United States players are restricted to play only with Bitcoins. The slots section contains a wide variety from SoftSwiss and Amatic platforms. Their specialty is 3D slots. These games contain numerous themes and a ton of bonuses with high payout rate and progressive features. Top of the line titles includes Platinum Lightning, Bells on Fire, and Eyes of Ra. The bonuses are overwhelming. Other than welcome bonuses, BitStarz also has individual game bonuses as well as monthly/weekly promotions for its old players. First off, players get 20 free spins just for signing up without even making a deposit. 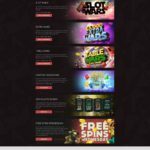 On first deposit, customers get 100% match bonus up to €100 or 1 BTC plus 180 free spins. Second deposit gets the player a 50% bonus up to €100 or 1 BTC. On their third deposit, they get a 50% bonus up to €200 or 2 BTC. Fourth Deposit gives 100% match bonus up to €100 or 1 BTC. Players also get Monday Reload Bonuses 50% up to €50. Live casino is also a sight to behold. The site offers three games Live Baccarat, Blackjack, and Roulette with variations. Players can enjoy these games with various dealers. Other than the classical, live casino also offers specialties like Keno and Bet on Numbers. There is no demo version of the games available to the customers need to log in to play these games. The table games section, however, is available in the demo and also contains more variety than the live titles. These games are mostly from the 1990s optimized up to today’s standards. Games from the live section are mostly provided by Ezugi, NetEnt, and Evolution Gaming. The site is also available on mobile devices. There is no special app to be downloaded for playing. The site is easily accessible from any mobile web browser. The best thing about this is the site adjusts itself according to the screen resolution for maximum comfort and experience for the players. Since many software providers on this site take care of mobile players, many games are well optimized for mobile gaming and render smooth gameplay. Customer service is one of the many things this site is appreciated for. They offer live chat 24/7 with friendly and professional staff. Customers have a 80% chance of getting their queries answered which is rare for many casinos. Other than live chat, players can also contact support through email or phone number. The site also offers help through social media which includes Facebook and Twitter. One of the best things about their support is that players can request a call from the casino. This saves them phone charges or wait time if the casino is having high call volumes. The casino uses the latest 256-Bit SSL Encryption firewall. This encrypts or encodes the data put in by the customer like password or credit card information. Many online casinos use this type of security as it is trusted by many authorities. All the games on the site are probably fair. Unlike many casinos, BitStarz allows its customers to check for themselves whether the game they play is fair or not. Every spin or card shuffle is controlled by two units; a server seed and a client seed. At the end of the game, the player uses the client seed to ensure every move made during the game was random. The players can get details about this method on the sites Provability tab under the Help Section.